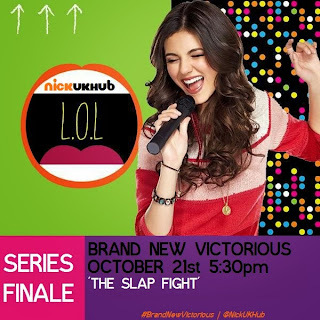 Nickelodeon UK & Ireland has announced the news that Nick UK & Éire will premiere the final brand new episode of Victorious, titled "The Slap Fight" on Monday October 21st 2013 at 5:30pm (6:30pm on Nick +1). Following the premiere, Nickelodeon will premiere the second episode of their brand new show Sam & Cat at 6:00pm, starring Victorious' Ariana Grande! Brand new episodes of the show will be aired every Monday night at 6:00pm, and following each premiere will also be a new episode of the new show Extreme Babysitting at 6:30pm.